At the near end of the northern section of the marina is the Noumea markets. Open every morning. Spacious, clean and organised. Heaven for Pip. Fresh produce. She knows what she wants – loves to cook. Can she cook! The night before I left we had spaghetti bolognaise. The major ingredients spent more than an hour in a steaming pressure cooker. Plus, the spaghetti expertly tossed and placed the spaghetti on our plates with two spoons. Gosh, I’m not used to all that. Can openers on my yacht! Pippa goes back to the crowds of past former Alan Bond heady days, Admirals Cup, Americas Cup and the rest. Years of it. But now exploring the South Pacific, takes the cake. What nationality? British, Australian, NZ; take your pick. Pip better not stand for Australian Parliament with all those nice nationalities. It’s illegal! I discovered what makes Pip wince. As mentioned earlier, at the northern end of the marina is the markets. A hundred or so meters further, on the right-hand side, is an ‘establishment’ that I had mentioned I visit, as I do. 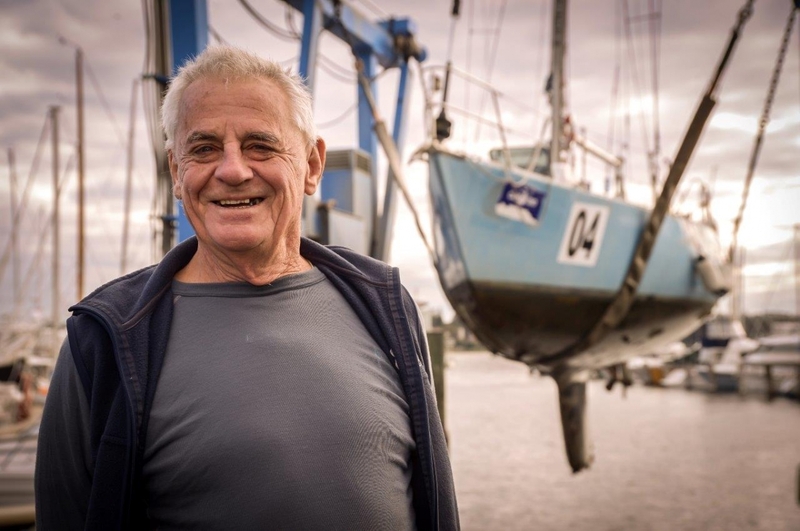 I remember her smiling partner (John Sharpe) from on board Peter Milner’s yachts (Western Australian boat builder – who would build his own ocean racing yachts), as they would pass my own, Perie Banou. Oops, that might suggest his yachts would come from behind. Ok, maybe they were going the other way. 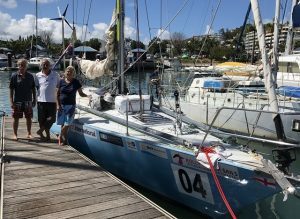 Peter always had a very regular crew: Terry Page and co. (Terry did a Cape to Rio Race in 1976 on Perie Banou I). He will be reading this. Talking of boat builder, I had, via Royal Perth Yacht Club, a surprise email from Doug Brooker in Sydney. Doug and I have said hello to each other as we sailed by, going in different directions, on Sydney Harbour. He obviously recognised my yacht. I am unlikely to forget his name. As this very yacht sails about the world, and must clear in and out of ports. Requires filling in documents. Same questions, always the same. Name of builder of vessel? Doug Brooker. Here is a bit he wrote. Thanks Doug. 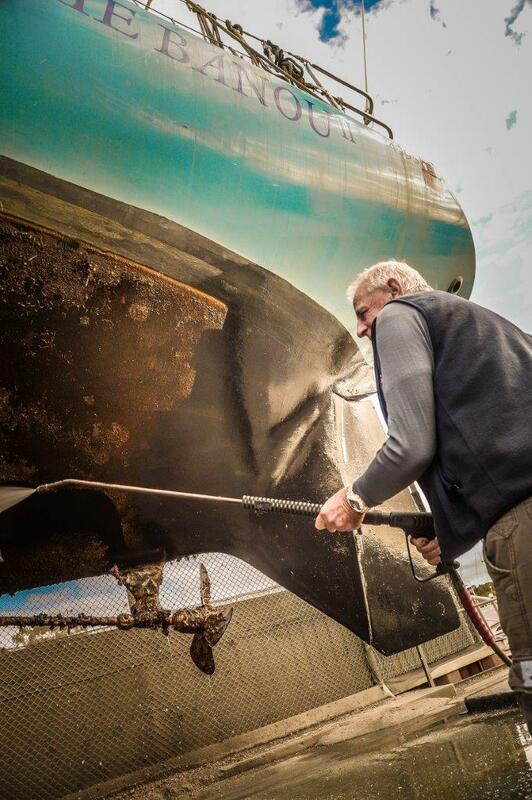 ‘Touch wood’ your boat is still unscathed. As they say, “it keeps on keeping on.” It does so too! Before leaving Noumea, I am preparing to go, as one does. Thinking to myself, the gear is good, everything fine, I can go anywhere! As I usually do. I motor out the marina into the beautiful, now quiet wide lagoon, connect the electric tiller to auto steerer, press the electric auto start button and it makes a funny noise. Looks jammed – is jammed. Won’t work. Blimey! Not a lot of wind for the wind vane self-steerer – connects to the steering wheel. Nevertheless, I flick the lever, pull the pin on the wind vane and the robust cogs connect, and the thing is supposed to start steering. But it didn’t. The top cog moved back on the shaft, came out of the mesh jumped connection with the bottom cog. Blimey #2. What’s going on? One goes thousands & thousands of miles and the steering works ace. Stop in New Caledonia for two weeks. Then the auto pilots don’t work no more. (Not one, but both). Weird. It took me about 1 1/2 hours to fix the wind vane. Awkward. I needed a nylon or Nylex spacer to keep cog in position. Not got any of those. I made two spacers, both sides of the bold cog on shaft, out of cable ties and lashing. Amazing, it works a treat. Plus, located the cogs perfect dead centre – a miracle. Ace it again. Later, I took the back off the electric auto steerer. Made it sort of work for short time. It seems I’ve worn it out. I think it has had its ‘used by’ used. It is for light airs and would probably last a life time on Sydney Harbour, or the Swan River Estuary. I will buy another in the advent the self-steerer cannot be made to work. With the Skeg supporting rudder, plus helped by being an older design, I can make the yacht steer itself. 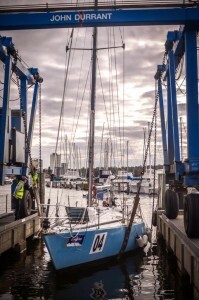 With different yachts – been there, done that, they are not as efficient. Not so nice. Anyway, for now, all looks good. On a very long haul, as in former years, I have carried a spare wind vane self-steerers. One can change them over or use them for spare parts. When you read this I should have arrived in Bundaberg. (When no one is looking I might sneak a Bundy in. [Rum – i.e. : lots of sugar. Cane sugar]). They sure know I am coming. Getting bombed by emails. Some remind me to let “Yacht Report at Border Force” know I am coming at least 96 hours before arrival, otherwise big penalties. I did that from New Caledonia and just updated my ETA. There are clues when nearing Australia. The wind and weather does different things. A fly will fly into the cabin and land in your coffee. (Likely to be more than one if it’s soup). That’s because Australia breeds long range fly’s. Knew you wanted to know that! They are actually part of the environment. Best regards to all. (Bundy here I come).